Dark Days: The Forge #1 – Metal Foil Cover! Giriamo un annuncio della Diamond, in inglese perché comunque riferito a Comics in lingua originale. IMPORTANTISSIMO: scadenza assoluta preordine (se già non l’avete preordinata): Domenica 07/05! Qualsiasi ordine successivo non verrà garantito! The great comics event of summer 2017 is about to begin courtesy of superstar writers Scott Snyder and James Tynion IV and illustrated by a master class of comics artists: Andy Kubert, Jim Lee and John Romita Jr.! Now, DC announces that this issue’s cover by Jim Lee and Scott Williams will feature a special foil stamp that gives the cover a metallic sheen. You can see a video of the cover HERE. 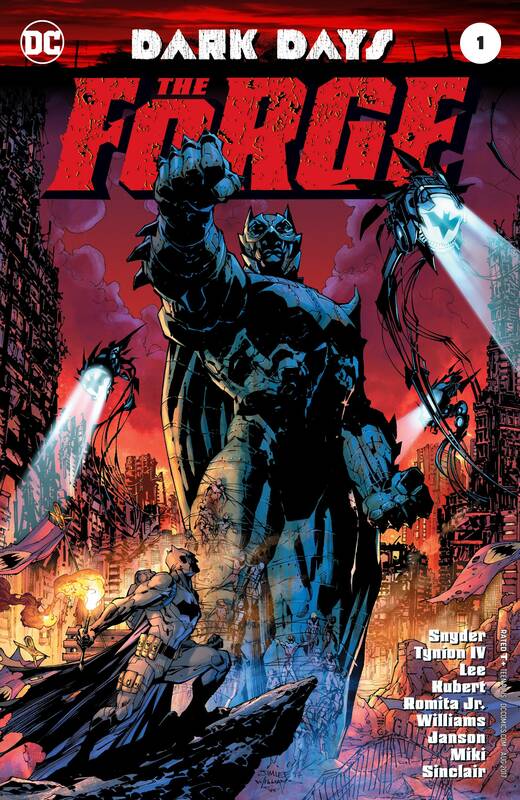 In DARK DAYS: THE FORGE #1, darkness comes to the DC Universe with the mystery of the Forge! Aquaman, The Flash and more of DC’s pantheon of heroes suspect Batman of hiding a dark secret that could threaten the very existence of the multiverse! It’s an epic that will span generations-but how does it connect to the origins of one of DC’s most legendary heroes? DARK DAYS: THE FORGE #1 is a 40-page one-shot with card-stock covers. It is written by Scott Snyder and James Tynion IV, with art by Jim Lee, Andy Kubert, John Romita Jr. and others. This issue features a foil-stamped cover by Jim Lee and Scott Williams (APR170259). It also features variant covers by Andy Kubert (APR170260) and John Romita Jr. (APR170261).